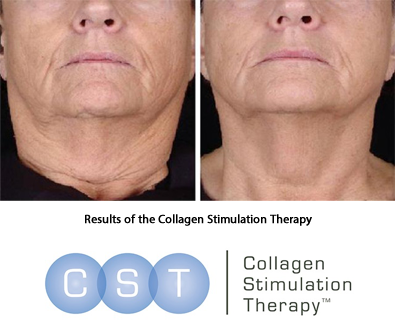 Collagen Stimulation Therapy™ (also known as skin needling) harnesses the body’s natural powers of healing to smooth the skin and achieve incredible results. This cutting-edge treatment is especially effective for addressing the visible signs of ageing, as well as acne scarring, slackened skin, stretch marks, uneven skin tone and dilated blood vessels. The above pictures show the procedure with clingfilm over the anaesthetic being applied, time for anaesthetic to take effect and the skin immediately after skin needling treatment. This slight flushing reduces over the course of a few hours. For best results we recommend a course of either 6 or 12 treatments along with taking collagen boosting vitamin supplements. To ensure the skin is cared for correctly, using Environ homecare products before and after the treatment is essential. Pre-paid course of six, 975.00 saving you 270.00. Home care products not included.